One of NHL commissioner Gary Bettman's most remarkable attributes, along with his mutant ability to absorb colossal booing without losing his grin, is the way he rarely offers ammunition to his opponents. He sticks to his messages like Tom Cruise climbing that tower in Dubai. While others can describe the taste of their own sole, Bettman rarely places his foot in his mouth. When he sits down with someone who can spar with him — see any of his Ron MacLean duels — Bettman turns questions on the inquisitor, keeps the answers vague and refuses to acknowledge the confrontational interview was even "confrontational." Yet all of what Bettman does so well as the owners' mouthpiece was undone in an infamous prediction back in 2004: That a new economic system in the NHL would yield lower ticket prices for a "majority" of teams. It's the most oft-repeated "lie" of the previous lockout, and has haunted Bettman ever since the owners got the system they wanted following a season in ruin. It remains one of the most popular talking points among Bettman's critics, and offered as evidence that the owners are not to be trusted. The ticket "pledge" has been a plank in the pro-players platform since the lockout. "Eight years ago, the NHL mounted a massive public relations campaign to justify its reach into the players' pockets, much of the appeal to the fans resting on a pledge that a hard cap would result in lower ticket prices." "The average NHL ticket price has increased 39% since 2004 when Gary Bettman promised fans a salary cap would lower ticket prices." In 2004, Bettman promised ticket prices would go down if the league got the labor agreement it wanted. He even scoffed at the "abstract theory" of supply and demand. "The fact of the matter is, more than a majority of our teams would use the opportunity of economic stability to lower their ticket prices," Bettman said. The Bettman Ticket Price Promise tracks back to the 2004 All-Star game in Minnesota and his "State of the NHL" address, whose transcript has been preserved on several message boards including NJDevs.com right here. Q. Are you prepared to make any sort of assurance to fans that if there is cost certainty, if you achieve your goals in the C.B.A., that there will be some cost certainty in terms of ticket prices, as well? In a lot of cities, it's more supply and demand than it is revenues. COMMISSIONER BETTMAN: I'm going to answer your question, but I'm really glad we are not getting bogged down on collective bargaining on All Star Weekend. Every market is different. Every club's ticket pricing structure is different. We've actually had some teams that have recently lowered ticket prices. I believe that our current economic system has been inflationary, not only with respect to our expenses, but with respect to ticket prices, as well. And I do believe there is a direct link. With the right economic system we can take the pressure off of ticket prices, and I believe with the right economic system, many, if not most of our teams, will actually lower ticket prices. I believe we owe it to our fans to have affordable ticket prices. I've often bristled at the idea that Bettman "promised" fans lower ticket prices, because that's a level of commitment he rarely reaches in his rhetoric — outside of promising, like, the Winter Classic will be a "unique experience" or some such. But there's nothing vague about this: With the "right" system, "many if not most" of the NHL's teams "will actually lower ticket prices." Q. Do you really believe that the teams that are filling their buildings now with the ticket prices that are now will be willing to drop ticket prices if there's cost certainty? COMMISSIONER BETTMAN: What I said was it varies market to market. The one thing that would not be sensible to do is lower your ticket prices to enrich scalpers. That doesn't make any sense. But the fact of the matter is, more than a majority of our teams would use the opportunity of economic stability to lower their ticket prices. It varies from market to market. As I said there are some teams that have lowered their ticket prices already. "Enrich the scalpers"? The hell? In 2004, by and by the way, there were 15 NHL teams with an average home attendance (tickets distributed) of over 17,000 fans. That number stood at 18 in 2011-12; and 14 of them average over 18,000 fans per game. Q. Just picking up on the ticket prices point, an economics professor would probably say that ticket prices should be based on what a market can support and the yield; not on expenses. Can you comment on that and why it is then that teams would lower their ticket prices if salaries went down? 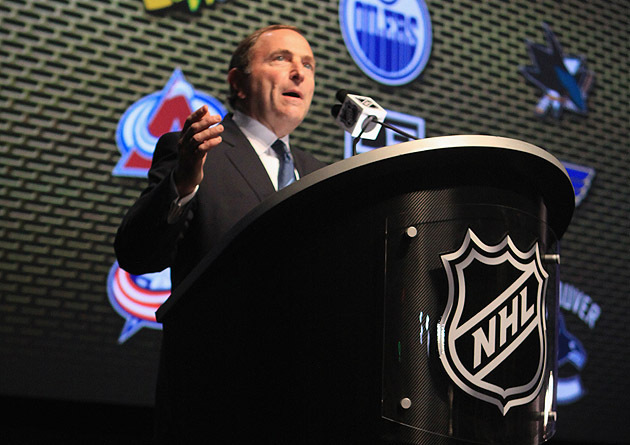 COMMISSIONER BETTMAN: Economics professors generally teach classes of theory in school. They don't operate businesses and they don't operate sports franchises. I've been in professional sports for 24 years, and I'm telling you, there's a direct link between what happens in an inflationary environment where teams are losing money and what they feel compelled to charge for tickets. I have absolutely no doubt there is that link. And that's from real-world experience and not based on abstract theory. This will now get me in trouble with lots of economics professors in North America, but so be it. "Nobody knows what the damage to the sport will be. … Nobody knows what revenues we can count on. I suspect we're going to have to do a lot with our business partners, with our fans in terms of ticket prices." "There's a direct link between what happens in an inflationary environment where teams are losing money and what they feel compelled to charge for tickets." The previous system was seen as inflationary. The "cost certainty" of a hard cap was seen as its antithesis. By that logic, teams would lose less money and the savings would be passed on to the consumer. And yet NHL tickets cost 39 percent more now than they did in 2004, on average. But let's go with Bettman's premise for a second: If teams aren't losing money, then their ticket prices will reflect those profits. Wouldn't increased revenue sharing, as proposed by the NHLPA, then help stabilize or bring down the cost of tickets in places like Nashville ($51.04, on average, from Team Marketing Report) or Long Island ($49.06)? Like any other commodity, an NHL ticket is priced according to supply and demand. A team that sells out every game will almost certainly raise ticket prices on a regular basis, because it can. A team playing to a half-empty building will eventually have no option but to cut the cost of a ticket. How else do you explain the fact that the Buffalo Sabres announced cuts to ticket prices for 2004-05, even though they increased their payroll over the summer? The Sabres have too many empty seats to fill. In fact, figures throughout the NHL suggest their is little relationship between ticket prices and salaries. The New York Rangers, for example, have posted the highest payrolls in NHL history in recent years. But their average ticket price ranked 12th in the league in 2003-04, partly because the Rangers have to keep prices reasonable to compete in a sports-saturated market. It's supply and demand, with the demand increasing as the team's good fortune (or entertainment value) does. Why would the owners cut ticket prices in the five years after the lockout when (a) the on-ice product was more exciting than it had been in nearly 15 years and (b) the league's new economic system created parity, which created close playoff races, which created interest in moribund markets like Chicago and Boston again? The number of "losing" teams seemed smaller after the lockout thanks to the forced parity of the salary cap and the league's standings. Bettman was wrong in saying a majority of the teams would rollback ticket prices as salaries were rolled back, but he was right that ticket prices are set on a market-by-market basis. While writers like ESPN's Terry Frei suggested that "Bettman should twist arms and mandate at least 20 percent cuts in those markets where the payrolls will go down at least $10 million next season" after the lockout, the fact is that it was up to each team to assess the damage and act accordingly. Within a few years of the canceled season, the wounds had scabbed over the fans were back to filling every arena whose teams gave them a compelling reason to return. Did Bettman vow that ticket prices would be lower under a new CBA back in 2004-05? Yes, and that faulty prediction has continued to make the NHL and the owners look downright misleading in their rhetoric. That's why in 2012, we still read about the Bettman Ticket Price Promise — not so we can expect another one, but so we're reminded to never buy into speculation from a man that abhors it.